Hair Loss Age: What Age Should Women Expect to Experience Hair Loss? What Age Should Women Expect to Experience Hair Loss? The average woman loses about 125 strands of hair every day. While normal hair loss when you shampoo, brush your hair, or even just losing strands throughout the day isn’t something to worry about? If you’ve noticed you’re hair getting thinner, it’s likely a cause for concern. Shockingly, about 40% of women are currently struggling with a more severe form of hair loss. But what is the standard hair loss age, and when might you be able to expect hair loss? What causes this loss of hair, and what can you do to stop it before it gets any worse? We’ll tell you everything that you need to know in this post. Before we discuss anything else, let’s talk about the basics of hair loss age. Your age doesn’t have nearly as much to do with your hair getting thinner as you might have thought. Just like many health conditions and diseases, hair loss in women can happen at any age. In fact, nearly half of all women experience moderate to severe hair loss before they reach the age of 50. 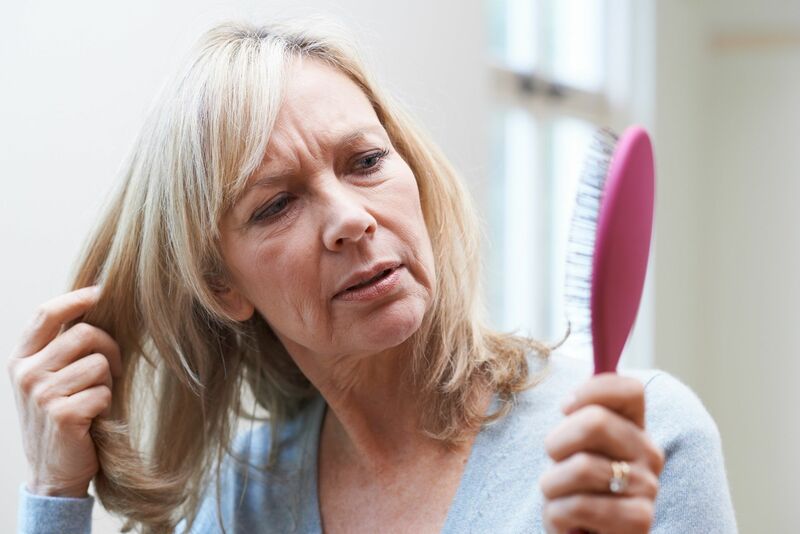 While yes, menopause is sometimes a factor in women’s hair loss and hair thinning, it is far from the only reason that women lose their hair. If you’re losing hair, you likely fall into one of two categories: genetic or reactive hair loss. If you have genetic hair loss, it means that others in your family have likely experienced balding or thinning hair. So, your genes make it more likely to happen to you. If you have genetic hair loss, you’ll slowly lose more and more hair over time. The second type of hair loss in women is known as reactive hair loss. This means that you’re triggering the hair loss in some way — either internally or externally. One of the most common reasons for hair loss in women? Your estrogens, or the female hormones, are what helps to ensure that your hair keeps growing and stays healthy and strong. However, in some cases, those healthy estrogen hormones are canceled out by an excessive production of androgens, which actively interfere with your hair’s growth cycle. In some cases, your body produces more androgens because of conditions like PCOS or some sort of thyroid disorder. So, in addition to seeking hair loss solutions, you may also need to make an appointment with your doctor to treat your condition. Another cause of hair thinning in front for a female? A lack of proper vitamins, and an imbalance in nutrition. Many times, women experience hair loss because they’re not getting enough B12 vitamins. B12 helps to keep your red blood cells in good health. Since your red blood cells are responsible for carrying oxygen throughout the body, not getting enough B12 can lead to more rapid hair loss. You may also be experiencing an iron deficiency or even anemia. Since iron is what helps your body to create hair cell protein, it’s easy to see how not getting enough can cause you to lose hair. Finally, many people are surprised to learn about the connection between weight loss and hair loss. While shedding a few extra pounds won’t have much of an impact on the health of your hair, a more dramatic makeover will. This is because when you’re trying to lose a significant amount of weight, your body often relies on its stores of energy to power you through the day. Especially if you’re losing weight through crash dieting, you can experience a nutritional deficiency. Plus, this can cause serious emotional stress — one of the main causes of hair loss. So, now that you know what causes hair loss in women, we know that you’re anxious to find a solution. Depending on the cause of your hair loss, you can seek out special tablets, shampoos, and other solutions. For example, if you’re struggling with hair loss due to factors like stress, sudden weight loss, or even a change in the season, look for delayed-release tablets that do more than just protect the hair you have left. For example, our Tricovel Triple Action tablets contain Biogenia, which actively works to stimulate new hair growth while strengthening your strands. You can also look for topical vials that deliver hair nutrition straight to your scalp. This way, the product will be delivered directly to your hair follicle, which means that it will stay in place even after you wash your hair — without weighing down your scalp. Make sure that you also use a shampoo that works to promote hair growth and keeps your hair healthy. We hope that this post has helped you to learn more about hair loss age, the common causes of hair loss, and what you can do to stop it from happening to you. Remember that, even if you’re currently struggling with hair loss, there are many solutions out there to reverse it. If you’re looking for quality products that you can use at any age, we invite you to give ours a try. Spend some time on our website to learn more, and reach out to us with any questions.